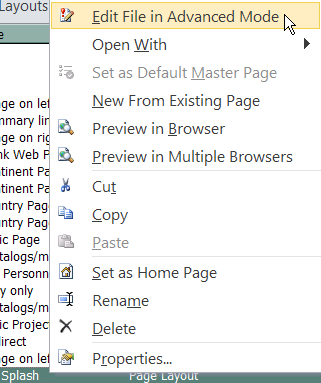 Can’t Edit Page Layout in SharePoint Designer 2010 | Are you a user? Are you having issues opening a page layout in SPD 2010 for editing? Is everything highlighted in yellow? John White has a good explanation of what your problem probably is. You need to edit the file in Advanced Mode. What’s Advanced Mode? It’s opening the file so you can really edit it instead of opening it in a mode where you can’t edit it…even though you clicked on Edit File. Perhaps it should be called "Really Edit the FIle" (That was supposed to be tongue-in-cheek humor). What’s interesting is sometimes you’ll be asked if you want to open the file in Advanced Mode and other times the file will open in "read only" (yellow) mode. Call me old fashioned, but when I click Edit File, I intend to edit the file. Right-click the file and select "Edit File in Advanced Mode." Or, with the File Information screen displayed, select the Edit File drop-down and click on "Edit File in Advanced Mode." Either way, you’ll be able to edit the file, as you probably intended to do in the first place. Gahh!! That is annoying! Thanks for saving me some time! So what do we do when “Edit file in advanced mode” is grayed out? Could that be caused by not having the appropriate security to edit the file? What file are you trying to edit? The reason the “Advanced Mode” is grayed out / greyed out in SharePoint Designer 2010 is that you have not enabled the “Enable Detaching Pages from Site Definition” check box on the SharePoint Designer Settings page on the site collection. This is found by going to the top site collection and selecting “Site Actions>Site Settings>Site Collection Administration>SharePoint Designer Settings”. Alternatively you can go straight to the URL by using htis format. NOTE: You will need the appropriate administrative rights to get to this location. 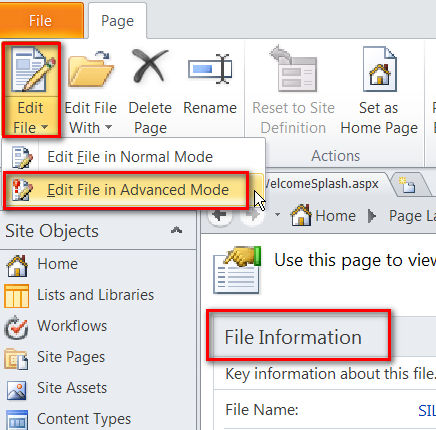 Once you check the box you will be able to click on the “Advanced Mode” button in SharePoint Designer. as usual damn you stupid Microsoft! Thank you! I’ve already wasted enough time trying to figure this one out. Hahaha… “Really Edit the File” Maybe Microsoft will push out that menu feature in an upcoming patch! Your post fails to mention why pages do not initially allow you to edit sections of them. Most SharePoint pages are ASP.NET “content” pages that utilize a “Master Page” as a template from which layout and certain static content is defined. This template is stored in the file system of the SharePoint server (the Hive) and when a content page that utilizes a Master Page is requested, SharePoint gets the content from the content database and injects it into the Master page, which is gotten from the file system. The two are merged and delivered to the client. But, when you edit a file in Advanced Mode, you are modified the original Master Page and will cause it to be stored in the content database from now on, rather than live on the file system. SharePoint will warn you about this when you save your changes and it will indicate such by placing a blue circle with a white “I” icon next to the file from now on. Changing a master page is dangerous (all pages that use it are affected) and storing it in the Content Database is not as efficient as serving it from the file system. Editing in Advanced Mode should be done with great care and not haphazardly! Agreed, but most of us edit in advanced mode on a regular basis!